Have you heard about the Cairns Chinese Friendship Gardens? Let us show you how to get there! Scroll down the page to also see our photos. If you staying in Cairns city, walk from your hotel to the Lake Street Transit Mall. You can take the number 7A Bus to a place called “Centenary Lakes” or the “Botanical Gardens”. Just tell the bus driver you want to get to the Cairns Chinese Friendship Gardens. We recommend you get off the bus on Greenslopes Street, then walk thru the main gates and thru the round arch to get to the large red Pagoda! This place has such a beautiful tranquil feel, you can see many water birds, large palm trees, fish swimming around, freshwater turtles sunbaking and Lilly pads. Make sure to bring your camera to capture beautiful photos. Entrance to the Cairns Chinese Friendship Gardens is FREE! You can easily spend 2 or 3 hours here so you might also want to bring some water, lunch or snacks. After visiting the main Pagoda you should start to walk thru the gardens towards Collins Avenue (Walk North along the trail). The trail leads you over a bridge and thru large Bamboo Forests. The path eventually brings you out to Collins Avenue which is where the Cairns Botanical Gardens are located. There is also an area called the TANKS Arts Centre. This is a community-driven arts precinct that presents many bands, music, art workshops and farmers craft markets. Collins Avenue, Road to the TANKS Art Centre. After walking West along Collins Avenue the path leads you back into the Rainforest Boardwalk (Now you will walk South again toward the Cairns Chinese Friendship Gardens). This boardwalk takes you thru low land paperbark Forests with swampy water and many interesting trees. Low Land Paperbark Forest Board Walk. The boardwalk eventually brings you back out to the Chinese Friendship Garden with a magnificent view of the Red Pagoda looking out over the lake. The North View of the Pagoda. 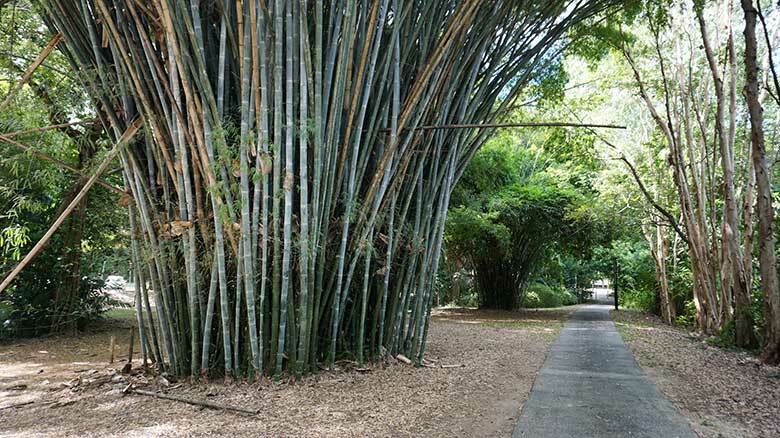 The Cairns Chinese Friendship Gardens is the perfect place for families with children, solo travellers, and couple wanting to explore a beautiful part of Cairns. It is great for bird watching and walking thru the Rainforest and around the lakes. Best of all it is also FREE. Clear view of Cairns Chinese Friendship Gardens. It is open every day, check the signs thru out the park, they have fantastic walking maps and information about toilets, chairs, tables and sitting areas. The main entrance round archway. Cairns Tour Info is an independent travel agency based on the Cairns Esplanade. If you need help choosing a tour to the Great Barrier Reef or surround Rainforest give us a call on +61740411635 or try our tour finder. The best way for us to help you find the perfect tour in and around Cairns. ← Norman Reef Pontoon Cairns – Things to do!